Boredom is the enemy as far as I’m concerned, so yesterday, I decided the time was right to give my plants an autumn makeover. I grow a few ivy plants above my kitchen cabinets, and I climbed up to take away the dead leaves. It occurred to me that this was the perfect opportunity to decorate for Halloween, so I started draping cobwebs across my plants. 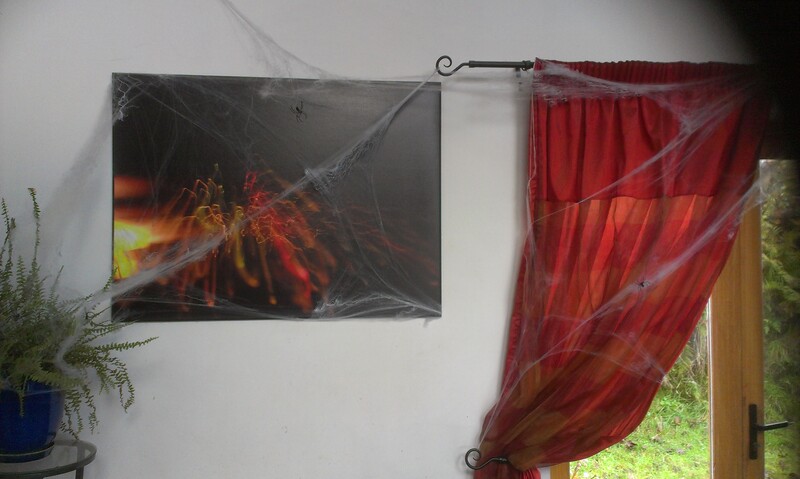 (I had to get rid of all the real cobwebs first, of course!!) Then, creativity got the better of me, and I stretched the cobwebs from one end of the room to the other. It wasn’t long until the kitchen resembled a scene from Great Expectations, and, according to my son, I didn’t look unlike Miss Havisham either! At least I know who I’ll be dressing up as this year! Happy Halloween!